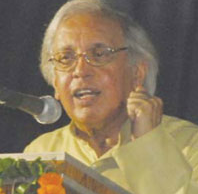 In Orissa Sahitya Akademi’s series of Prof. Arta Ballav Mohanty Memorial Lectures this year, India’s eminent poet Ashok Vajpayi lauded Oriya language as the language that bears the country’s oldest poetic tradition. Not only poetry had blossomed in Oriya matchlessly early, but also it had made an unique pattern of its own. The richness of lucidity, rich also in diversities in style of presentation, makes Orissa’s old poetic tradition unique. The vastness of vocabulary covering cross-referred subjects on every facet of life and society as marked in the works of Adi Kavi Sarala Das is not found even in Hindi literature of those days, said Vajpayee. He pointed out that a poet’s strength of memory linked to empirical knowledge and societal tradition makes his work utmost relevant and of permanent value. This is seen in Sarala’s works. And, this is also reflected in works of Prof. Mohanty under whose able editorship Sarala Mahabharat could enter from the ranks of palm leave manuscripts into the modern world of print. The memorial lecture was witnessed by Orissa’s Minister of Culture Prafulla Samal in the auditorium of Utkal Sangeet Mahavidyalaya, Bhubaneswar amongst hundreds of persons of letters and intellectuals on Sunday. It is difficult to believe that Vajapeyi ji or hsi audience has not heard about Valmiki, called Adikavi. He could be from Orissa. However, Krushna tells in Gita that he is Ushana (Shukracharya) among Kavis. Among Prakrit literature, Baul gitas originated in Orissa. Oriya literature started in 78 AD as per Sarasvati-kanthabharana alankara. Oriya literature was very popular in 8th century by disciples of Gorakhanatha whose Pitha was at Jajpur. His disciples are still having Natha title. I regret the delay in publishing your comment, due to certain technical defects. I am strongly recommending your words to all the visitors here. Thanks. I still wonder why Oriya literature did not flourish like Pali, though it was one of the eight vernaculars of ancient India and why it only flourished in the3 medieval period of indian history. I wish someone to conduct a research on it. Delay in reply regretted. You may please contact me at orissamatters@gmail.com. Thanks.